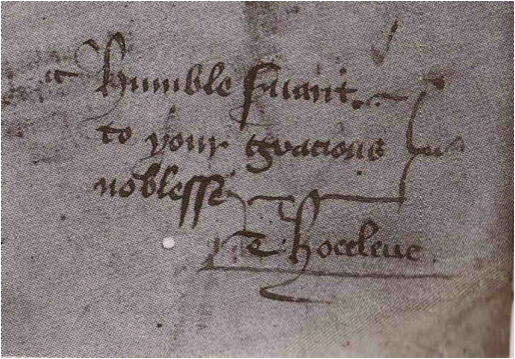 What follows are digital transcriptions of verse by the middle-English poet, Thomas Hoccleve, supplemented by a built-in lexicon of Hoccleve’s Middle English. Underlying this edition is a unique conjuncture of medieval scribal technologies, pioneering early work in what was then called “humanities computing,” and a twenty-first century digital humanities initiative to create a digital archive intended to bridge centuries of communication technology to create a powerful tool for teaching textual scholarship in the digital age. Two very distinct sets of primary documents made this edition possible. The first are three medieval manuscripts, carefully written in a professional medieval secretary hand by their author, Thomas Hoccleve. The second are a series of computer files (the HOCCLEX files) created in the late 1980’s to facilitate a never-finished critical edition of Hoccleve’s magnum opus, The Regiment of Princes. To most contemporary readers, both sets of documents pose serious interpretive challenges. The conventions and style of medieval script makes them largely inaccessible to students without specialized training. No less difficult are the HOCCLEX files, which required several rounds of digital transformation to exist in the form seen here. Under the direction of Robin Wharton, a team of Student Innovation Fellows at Georgia State University has brought the medieval manuscripts and the HOCCLEX files together to create a prototype edition of Hoccleve’s holograph poetry. Originally launched as a plain text edition, in the winter of 2017 we added a major new feature, integrated access to the Hoccleve Lexicon. To search the lexicon, simply highlight and then right click on any word in any poem, then choose to search for other instances of the word either within the poem or across all the minor poems. If the edition text is not displaying in the iframe below, you can access it here.